Sugar Free Gummy Bears made by Astra have a very nice fruity flavour. Made in Belgium the sugar free Gummy Bears are of an exceptional quality. 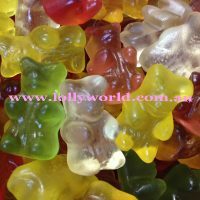 Sugar Free Gummy Bears made by Astra have a very nice fruity flavour. Made in Belgium they are of an exceptional quality.